Our GOD Sings And HIS Voice— Is Beautiful! It’s been an entire month since I last shared with you guys, so I first want to start by saying I have missed you all and I love you so much! I’ve taken the last month and a half to truly seek The Lord more intimately, so I have been fasting, praying, and just asking God to breathe His Holy Spirit within me and to let my breath be His breath. When I enter into God’s Presence and my heart is crying out to Him, “Abba, please let Your breath become my breath.”, what I’m really saying is, “Father, the very same breath that You’ve used to breathe Your Life within my being, use me as Your divine vessel that I may breathe that same Life into the hearts and souls of others”. I have been humbly, yet boldly praying in faith that His gift of The Holy Spirit would not just increase within me, but that It would consume me. If you’re an avid reader of my blog, you know that my prayer has often been, “Lord, less of me and more of You”. Well, as He has answered that prayer and allowed me the honor of experiencing Him in a deeper way, my prayer has since become, “Abba, none of me and all of You”. The notion that God wanted to take me deeper in Him had been lingering in my spirit for months. However, unbeknownst to me at that time, my prayer had actually hindered my level of intimacy with Him because I was praying, “Less of me and more of You”, but He was longing to give me and to show me His more which was so much greater than the more that I had been expecting and praying for. The Spirit led me to fast and pray because His more required that I seek Him with everything that I am and I needed that because there are some promises that He had spoken to my heart and some as far back as almost four years ago that I have been praying over continuously, but I’ve yet see them to come to fruition. I needed Him to speak to me to confirm those promises again because doubt had begun to creep in. And as a believer, you never want that because doubt is like kryptonite to our prayers. I faithfully live with a heart of expectancy. I know that His Words are true and I believe that He’ll do exactly what He’s promised me. It wasn’t that I doubted Him or His ability, but more so myself and if I had heard Him correctly the first time. I started praying, “Lord, remind me again. Send Th Holy Spirit to refresh me with the power and truth of Your Words”. So, to say that God has amazed me over this last month and a half would be an understatement because He has been blowing my mind. It all started with me having these dreams of me praying. I would then actually wake up to pray about what ever it was that I had just dreamt that I was praying about and as soon as I would go back to sleep, it would happen again— just a continual cycle. So, all night long, I’m dreaming about praying and then waking up to pray. Getting little to no sleep, but feeling more rested than if I had slept all night. It’s almost as if God was testing me and saying, “Will you obey Me calling you to pray when it’s inconvenient for you? Will you honor My requests even if it means disturbing or interrupting your time of rest?”. That may not seem like an inconvenience to most, but if you truly know me, you know that I have trouble sleeping even when I’m tired, so when I do fall asleep it is a rare and needed treasure. In me being obedient to His call to wake up and pray, He then started speaking to me through my dreams when I’m asleep and then through visions when I’m awake and showing me specific things about specific people, including myself. So, in remembering the following passage of Scripture, I wrote them all down in my prayer journal and began to pray asking God to give me revelation of them. (Habakkuk 2:2-3 GNT- The Lord gave me this answer: “Write down clearly on tablets what I reveal to you, so that it can be read at a glance. Put it in writing, because it is not yet time for it to come true. But the time is coming quickly, and what I show you will come true. It may seem slow in coming, but wait for it; it will certainly take place, and it will not be delayed.). I mean, He has allowed me to experience Him in divine ways and some I don’t even know how to put into words or explain. The more He revealed to me the more I desired to go even deeper and greater, and so much so that I then began to pray, “Lord take me deeper, show me more, increase and enlarge my territory of spiritual gifts. And He then brought this verse to mind, (1 Corinthians 12:31 AMP- But earnestly desire and zealously cultivate the greatest and best gifts and graces; the higher gifts and the choicest graces. And yet I will show you a still more excellent way; one that is better by far and the highest of them all—Love.) Essentially, what He was saying to me is, ” Desire more, but be careful not to desire My gifts more than you desire Me and don’t lose sight of the purpose to which I first called you to which is to love. First, desire Me because I Am Love and the gifts will follow and overflow.”. Can I tell you that truly humbled my heart? His purpose for increasing His power and Presence in my life wasn’t just to reaffirm His promises to me, but for a much greater purpose which was to refresh me so that I would to be able to exceptionally do what He’s called me to do— love His people and extend His grace on the level that He desires for me to with no distractions. I normally start my time of prayer and worship around 12am because that way God literally gets the first of my day, but it was around 10:30pm and I just felt led to pray and worship Him. So, I’m literally pacing the floor just praying and crying. I’m so desperate for His approval that I wanted Him to know that even though I desire His gifts they mean nothing without Him. I just cried, prayed, and laid my heart bare and exposed before Him about that as well as some other things that had been on my heart. I always sing during my prayer time, and there’s a song that Bethel Music sings called “I Want To Know You”. I started to play the spontaneous worship version of that song which is about 50 minutes long and I just started singing, pacing the floor, and crying out to Him from the deepest desperation of my heart and soul. And I began to sing the words, “Lord, I want to know You. Let Your Spirit overwhelm me. Let Your Presence overtake my heart.” and I just continued to sing that over and over again. And when I say, I want to know Him, I mean better than I know myself. … A few minutes before the song ended they start to sing the words, “Lord, put a new song in our hearts” and I stopped singing just to bask in His Presence. 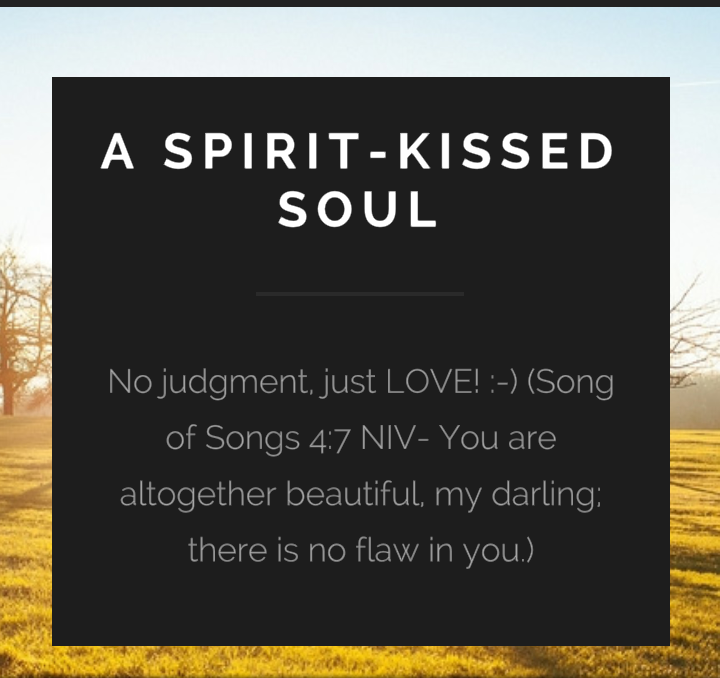 The Holy Spirit consumed me and in the sweetest whisper The Lord started to sing to me, “You know Me” over and over again in the same tune that I had been singing to Him. Those words are not apart of the song. That was just God being God. As His child, He loves me so much that when there was grieve within my heart, He chose to sing me a lullaby to calm my spirit, celebrate me, and remind me of His unconditional love for me. As He sang to me, I laid down on my bedroom floor face first and I just uncontrollably wept with joy. That is the most intimate and the most beautiful moment that I’ve experienced with God to this date and it brought today’s focal verse to my remembrance. (Zephaniah 3:17 CEV- The Lord your God wins victory after victory and is always with you. He celebrates and sings because of you, and He will refresh your life with His love.) As I wept, He spoke to my heart and said, “Don’t mistake Me lovingly teaching you as Me reprimanding you. You know Me and I love you.”. He literally refreshed my entire being by beautifully displaying His love for me through the expression of a song. Choosing to sing three simple, yet powerful words to my heart— “You know Me”. I got up off of the floor and I began to praise, worship, and sing to Him like never before. When I stopped singing it was 4:15am, my voice was almost gone, and I had not even realized that so much time had passed by. That’s the kind of time and intimacy that I want with Him every single day. I’m sharing this song with you because I am praying that as you listen to it, God will impart His divine wisdom upon you and put a new song in your heart and spirit that will replenish, refresh, restore, and remind you of His eternal love for you. Please set aside approximately 50 minutes, listen to it in it’s entirety, and truly give The Lord your all because I believe with all of my heart that God is going to do a mighty, Life-giving, and life-changing work within you through this song. Abba, I cry out to You on behalf of every person reading this. I lift them up in the name of Jesus and I ask and pray that today and everyday forth that Your Presence would manifest and ever-increase within their hearts and within their lives like never before. Help them to keep their eyes fixed on You, Father and as they do, impart Your divine wisdom, peace, and understanding upon them. Lord, release a fresh wind of Your Holy Spirit within their souls that they may intimately know You and all that you have purposed for them. Abba, within this very moment let Your unconditional love consume them, sing to them, and put a new song in their hearts that they may be replenished, refreshed, and restored unto You. Do a mighty and divine work within, through, and for them. I praise You for their lives! And in the name of Jesus Christ, Your precious Son, and our Lord and Savior— I pray, Amen and so be it.